If you are one of those people who usually work by themselves on cars and their trucks, you know you often need to crawl under the car to get things done like changing the oil, checking the suspension or maybe inspect some kind of damage. But I’m sure you wouldn’t want to jack your car or truck up for long periods of time or maybe you don’t have two jacks. In that case, only one thing can help you get that messy job done under the car. Car Ramps. These take away the trouble of jacking your car up plus, your car wouldn’t need to stand on the jack for too long as the concentrated pressure on a single point might start to bend where the jack is holding the car. In this article, we have come up with a list for you, with the names of the best car ramps out there in the market for you to get for your car and get your work done without a hassle. Each of the listed products has its own advantages and disadvantages. But every product has been reviewed in detail so you won’t have a problem in selecting the ramp that is good enough for your car or truck. If you want to learn a bit more about how to use the car ramps before a purchase, check our FAQ and information section at the bottom of the article. Scroll down or click Here. The RhinoGear RhinoRamps are as tough as their name. They are designed to be sturdy and long-lasting and provide your car or truck with enough ground clearance for you to work under it. 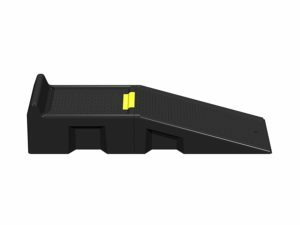 The ramp is made up of a special polymer compound patented by the company which gives it great strength to withstand a vehicle’s weight and balances it just perfectly so that it doesn’t fall over. The ramp’s surface on which the wheels rest is made up of a special base that they call CoreTRAC which is non-skidding and with that the chances of a car’s wheels slipping decreases with having you to worry about that no longer. Not only that but the ramp’s incline is of 17 stages which provide a rather gradual lift instead of a quick one which is extremely important for low profile cars with very little ground clearance because in that case, the chances of underside damage increases if things are not taken slow. 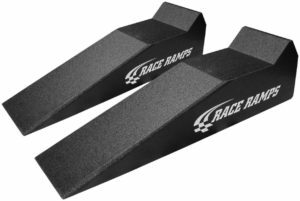 Race ramps make their ramps by keeping one thing in mind. High assistance for low cars such as sports vehicles. Upon research, Race Ramp Company figured that owners of low profile vehicles and other exotic vehicles often have trouble getting their car up a ramp without damaging the underside of it as they take it up. Keeping that in mind, Race Ramp designed a ramp which can lift up these low profile cars as high as 7 inches on a total of 40-inch length which tells you that the ramp will be very gradual to take the car up very smoothly and not cause any damage under the car. That is a sigh of relief by every low profile car owner because they can now finally work under their car without the fear of having damaged something or having the car fall off. 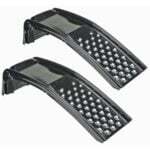 These ramps are best suited for exotic and sports cars with are closer to the ground. 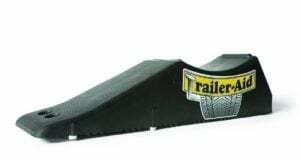 As per its name, Trailer-Aid ramps are aimed to assist trailers rather than cars and trucks. It is one of the interesting products in this list. Since aimed at trailers, this ramp can bear a max weight of 15,000 lbs and it’s completely waterproof and can also resist rust which makes it a tough ramp. It is also easy to clean and maintain. The ramp provides a gradual incline for a smooth lift and contains little holes for dust and debris to fall off. This ramp provides a clearance of 4.5-inch ground clearance so you have got a good ramp for your trailer. Nicky Nice is really a nice ramp with a nicely priced package containing a steel ramp that is strong and can hold cars easily. A max load bearing of 6,500 lbs balanced on each ramp side. The Scepter 08226 is a mid-ranged but quality ramp. It is a light-weight ramp but doesn’t compromise on the strength of it. The scepter 08226 can bear a max load of 12,000 lbs which is more than enough for most vehicles out there. It is suited for mid-sized sedans and other cars. The incline on the ramp is very smooth and gradual and the ramp itself is wide enough for most tires. Because of its good width, the ramp won’t push back with the weight of the car as it comes up on it. This way you don’t have to fear the ramp sliding off or the car falling off of it as it tries to tread up. The ramp has good grip so the car can tread up nicely without slipping. Both the ramps work perfectly at weight balancing thus increasing the overall weight lift. This ramp features a parabolic arc which uses the strength of both sides and balances the car weight accurately. Doesn’t work well with some particular low profile vehicles. 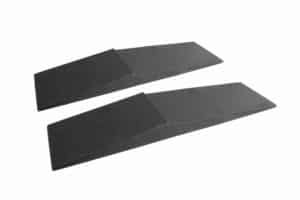 Discount Ramps are for you if you are searching for a mid-ranged, fair quality plastic ramp but sturdy ones. The 6009 version 2 ramp is made for low profile cars and can also be used with other cars and trucks as well. 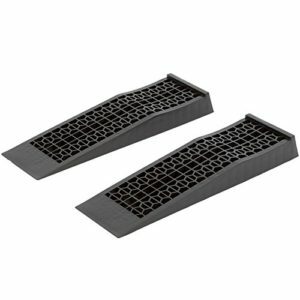 Even though being plastic, these ramps are good enough to hold your car stable. The 6009 version 2 ramp has a max bearing load of 4,400 lbs which is good enough for most heavy lifting. It can lift a vehicle up about 2.5 inches off of the ground. With its honeycomb pattern on the ramp, moisture build-up is prevented. The name Magnum also lives up to the standard of being called a good car ramp. Magnum’s Our very -01 ramp is more than just a simple ramp. It’s a 4 piece set with the ability to withstand great weight and features a safety chock to hold itself firmly. This brand is known for its attractive design and high quality as it meets the needs of most cars out there. Magnum ramps are easy to set up and are lightweight to carry around. Many customers claim that this ramp didn’t suit their particular car so it’s wise to test it first with your car before buying. Many ramps fall behind because they lack a gradual incline for a smooth lift. And many times, low profile cars end up being damaged from underneath as drivers try to get their cars up on the ramp. That makes it a hassle to self-service their car or even change the engine oil. But RR solves this problem by making a ramp to resolve all these problems. This is a ramp of about 56 to 67 inch and provides a gradual and smooth incline with a 6-step incline. So you no longer need to worry about scraping or damaging your car from the underside and with a good lift, you can work on the car easily. The RR-EX Xtender provides a highly stable load bear which accurately manages the weight of the car by combining the individual strength of each ramp side. That gives your car a nice and cozy platform to sit on. The surface doesn’t let the wheels slip so the fear of having the car slip off or fall off is omitted. The Black Widow aims at larger vehicles. That’s just how Black Window does. 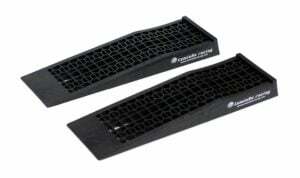 Whether you have an SUV, a large truck, a van or a larger sedan bigger than the normal sedans, then Black Widow ramp is best for your vehicle. 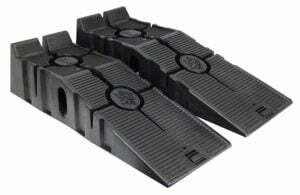 Your vehicle can completely rely on Black Widow’s ramps as their ramps provide a 7-inch lift off of the ground. This is ideal for large vehicles as the room is needed to work under. These ramps may be made out of plastic, but they are designed and constructed just as sturdy. This product is claimed to be long lasting and is able to bear the weight of an 8-ton vehicle without strain. That is just perfect for heavy duty lifting as that’s the purpose of Black Widow ramps. The nice design of these ramps manages the weight balancing just perfectly without shaking up the car. A drawback to using this ramp is that the incline is a bit steeper than the rest of the ramps but the grooves manage to get your vehicle up smoothly nonetheless. And since it’s mainly used for heavy vehicles, that’s good enough for them. The ramp provides a foot wide for tires. 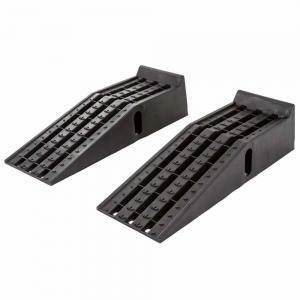 To conclude, Black Widow ramps are made for heavy-duty lifting and has a good name in the market. The Tomioka Racing Company is also one of those who looks forward to the problems faced by owners of low vehicles and the damage that is often caused by steep incline ramps. That is why Tomioka has a well-designed ramp for you which caters to the needs of low profile cars and exotic vehicles closer to the ground. So you no longer need to jack your car up to change the oil or check the underside. This product may be made out of plastic but its similar to the plastic used by Black Widow. The plastic used is tough and can hold a good weight so don’t be afraid of its design material. The strong plastic is what makes it lightweight without compromising quality and sturdiness. Its priced reasonably so you get a good deal if you plan to get this ramp. Working under the car does require good ramps as you cannot work for long with a car jacked up because it can damage the underside after prolonged use. Getting a good ramp ensures that you can work for as long as you want without fearing the car accidentally dropping off of it or slipping off. But considering there are so many ramps to choose from in the market, you should note a few things before getting either the most expensive one or the cheaper alternative. When you go out to get a ramp for your car, the weight capacity is extremely critical. You need to know the approximate weight of your car and the weight bearing capacity of the ramp you are choosing because if you get a lighter ramp, you risk damaging the ramp as well as the car. On the other hand, if you buy a heavy duty ramp when you have a normal sized car, it may be difficult to keep the ramp as they could be heavy due to the fact they are made for heavy vehicles. If you own a mid-sized sedan, a ramp with a weight capacity of 6,500 to 10,000 lbs will be enough for you which should cost you between $25 to $100 depending on the brand and build. The answer to this question is rather simple. Low profile vehicles are those which have a low ground clearance and are closer to the ground. These cars are usually exotic vehicles and sports cars. Their ramps are designed a little different. The ramps for these cars don’t lift the car too high which is good because otherwise the back of the car might hit the ground. So it’s critical to get a ramp particular for low cars to prevent damage to your car. When using any kind of ramp, caution is extremely advised as vehicles could tip over and it could be dangerous for you and even others around you. Besides that, your car could suffer heavy damage as well. A few easy steps to consider when using ramps will ensure that things go smoothly and you get your car work done without a problem. You now need to take side of the ramp and align it perfectly with the wheel. This is easier if your ramp is wide and tires are narrow. Now it’s time to get in your car and drive it up. Slowly press on the gas without turning the steering. Slowly and gradual drive up till you hit the ramp’s stop if it has one. If not, you will need someone outside the car to help you guide to stop at the center of the ramp. Now that you have your car positioned in the center of the ramp, activate your handbrake to your car from rolling back itself. Your car should sit on the ramp nicely without moving. Now it’s time to place the wheel chocks before each wheel that’s up on the ramp so that extra care can be made to keep your car from rolling down in case your car’s hand brakes are weak. Now you are equipped to work on the bottom of your automobile correctly together with your car ramps. What responsibilities can you operate vehicle ramps for? While still a lot of people use jacks and axle stands to keep their car elevated, these ramps provide a more safe way to do that. Plus, due to the concentrated pressure for a long due while using jacks and axle stands takes place, a little wear and tear does occur. In the case where you need to work under your work for a considerable amount of time, it is critical for both sides of the car to be lifted equally to not cause uneven wear on one side. A car is heavy with so many components. Uneven weight management can cause heavy damage if not managed properly. Depending on the ramp you buy, things can get easy and you wouldn’t need to worry about the weight management and balancing. The ramps will do that for you. Since the pair is made identical, both will be of same height. Following these tips will allow you to get your done job more quickly, easily and rather conveniently, as ample room is needed to work under a car. Jack stands won’t not give you enough freedom in that sense while ramps will make it safe for you to work under. With design tweaks, now ramps are good for low clearance and low profile vehicles too which makes those owners of such cars relived that they don’t need to fear about damaging their car from the underside. And with the smooth and gradual incline, the process is made simple and efficient. It can be difficult to lift low profile vehicles with axle stands and jacks as these cars usually have lots of components underside too. The risk of damaging these components increase in that way. Ramps designed for such cars also make sure not to lift the car off of the ground too much as to damage the rear end. What length of vehicle ramp do I need? The answer isn’t as simple and depends on a number of factors. It is good to get an extended ramp in the case when you have a big enough garage to accommodate the extension of the ramp. If you don’t have a lot of space in your garage, the extended ramps won’t work and you might need to take it outside of the garage to get your car up on it properly. It also depends on your vehicle. If you have a sports car or a car with low profile tires and low ground clearance, you will need a ramp with gradual include to smoothly get your car up as steep inclines might end up getting your car stuck under or worse, damage something underside of it. So as we mentioned earlier, it is very critical to get the right ramp for your car. In the case that you have a large garage with ample space, you may get an extension for the ramps if you didn’t already buy the ramps specifically for low profile cars. That way, the extension will compensate for the gradual incline and get your car up seamlessly. The lift height is also very important here. If your ramp has a max height of 5 inches, that should be countered by your car which should be 25 inches long. A low profile vehicle will suffer damage if lifted too high as they are already too low. A greater height will lift the rear to a point when it hits its read end on the ground. How long do automobile ramps last? Depending on the material used in its making, and level of usage and maintenance, car ramps last for quite some time. In extreme weather conditions, the ramps may start to degrade naturally but usually ramps are made in such a way that they don’t wear out that quick. To conclude, here are all the facts and figures for you. You now know the different types of ramps and their use for particular vehicle types. Just make sure that you consider all the point mentioned earlier before getting a ramp for your car. Remember, that not all vehicle ramps are made same and just as vehicles are low or high depending on their make, model and weight, so too are car ramps. It’s unwise to assume that simply because a low-priced car ramp looks or feels good enough, that might be suitable. That is also to say that just because you get the most expensive ramp, all is good. Ramps should be selected carefully according to the vehicle’s ground clearance, length and max weight. When all these things are in proportion, you’ll have a safe surrounding to work.